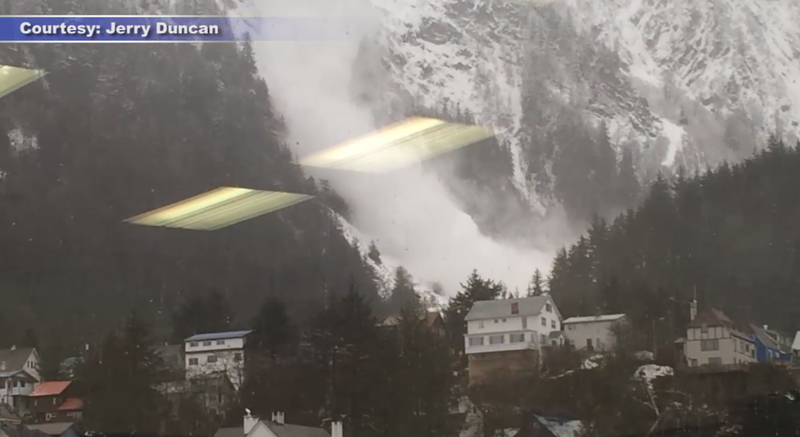 JUNEAU -- An avalanche near downtown Juneau was caught on camera Wednesday, CBS affiliate KTVA reports. Jerry Duncan said he was at work when he saw the slide coming down. The city’s urban avalanche forecaster, Tom Mattice, said he wasn’t expecting the natural activity on Mt. Juneau’s Chop Gully, but it is an area that is prone to slides. “Yesterday, it warmed up a little bit during one brief, really heavy snow shower and I think that was just enough to trigger the small slide,” Mattice said. No homes are near the area. Mattice said the snow turned into a “powder cloud” when it hit the 1,000 foot cliff in the basin and there was neither snow nor debris that reached a nearby hiking trail. Jueanu’s avalanche danger level is currently at moderate. Mattice reminds people to always take precautions when they’re venturing into the backcountry.